He is the son of Joseph Cenate and Charlotte Marie Graham. [S741] Wikipedia Online, Cenred of Wessex, online http://www.wikipedia.org. Hereinafter cited as Wikipedia. [S172] Original authors unknown: translated by Rev. J. Ingram, The Saxon Chronicle (Original manuscript completed about 1155, this translation first published 1823; reprint London, England: Studio Editions, Ltd., 1993). Hereinafter cited as Saxon Chronicle. John Speed's Saxon Heptarchy map, from his Theatre. According to the Anglo-Saxon Chronicle, Cerdic landed in Hampshire in 495 with his son Cynric in three keels (ships). He is said to have fought a British king named Natanleod at Netley Marsh in Hampshire and killed him in 508, and to have fought at Charford (Cerdic's Ford) in 519, after which he became first king of Wessex. The conquest of the Isle of Wight is also mentioned among his campaigns, and it was later given to his kinsmen, Stuf and Wihtgar (who had supposedly arrived with the West Saxons in 514). 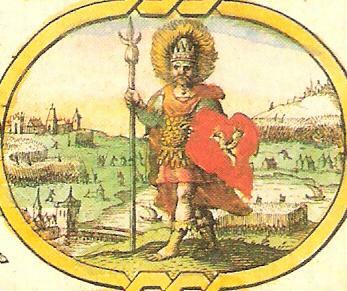 Cerdic is said to have died in 534 and was succeeded by his son Cynric. The early history of Wessex in the Anglo-Saxon Chronicle is clearly muddled. David Dumville has suggested that Cerdic's true regnal dates are 538-554. Some scholars suggest that Cerdic was the Saxon leader defeated by the British at the Battle of Mount Badon, which was probably fought sometime between 490 and 518. This cannot be the case if Dumville is correct, and others assign this battle to Ælle or another Saxon leader. It should also be noted that while Cerdic's area of operation was, according to the Chronicle, in the area north of Southampton, there is also stronger archaeological evidence of early Anglo-Saxon activity in the area around Dorchester-on-Thames. This is the later location of the first West Saxon bishopric, in the first half of the seventh century, so it appears likely that the origins of the kingdom of Wessex are more complex than the version provided by the surviving traditions. Some scholars have gone so far as to suggest that Cerdic is purely a legendary figure, and had no actual existence, but this is a minority view. However, the earliest source for Cerdic, the Anglo-Saxon Chronicle, was put together in the late ninth century; though it probably does record the extant tradition of the founding of Wessex, the intervening four hundred years mean that the account cannot be assumed to be accurate. [S741] Wikipedia Online, Cerdic of Wessex, online http://www.wikipedia.org. Hereinafter cited as Wikipedia. [S172] Original authors unknown: translated by Rev. J. Ingram, The Saxon Chronicle (Original manuscript completed about 1155, this translation first published 1823; reprint London, England: Studio Editions, Ltd., 1993), p. 22, A.D. 534. Hereinafter cited as Saxon Chronicle. [S172] Original authors unknown: translated by Rev. J. Ingram, The Saxon Chronicle (Original manuscript completed about 1155, this translation first published 1823; reprint London, England: Studio Editions, Ltd., 1993), in the regnal list in the Preface. Hereinafter cited as Saxon Chronicle. He married Minnie Shoemaker, daughter of Mathew Shoemaker and Alice Olds. He died in 1973. Marriage* He married Minnie Shoemaker, daughter of Mathew Shoemaker and Alice Olds. She is the daughter of Jack Chalfant and Minnie Shoemaker. She married ? Ormsbee. [S465] Dr. A. M. Stackhouse, Col. Timothy Matlock, Patriot And Soldier (republished on CD in E-book format) (1910; reprint www.cdgenealogy.net: J. Lewis, Feb 2002), p. 72. Hereinafter cited as Col. Timothy Matlock. She was born after 1622 at Leyden, Holland; born probably in the late 1620's.1,3 She was the daughter of Roger Chandler and Isabella Chilton.2 She married John Bundy before 1649.1 She died on 1 May 1674 at Taunton, MA. [S129] Robert Moody Sherman & Verle Delano Vincent- Rev by Robert S. Wakefield, Mayflower Families Through Five Generations, Vol 15 (4 Winslow St., Plymouth MA 02360: The General Society of Mayflower Descendents, Plymouth, MA:1997, 1997). Hereinafter cited as Mayflower Families Thru 5 Generations. [S129] Robert Moody Sherman & Verle Delano Vincent- Rev by Robert S. Wakefield, Mayflower Families Through Five Generations, Vol 15 (4 Winslow St., Plymouth MA 02360: The General Society of Mayflower Descendents, Plymouth, MA:1997, 1997), p. 5. Hereinafter cited as Mayflower Families Thru 5 Generations. [S646] Robert Charles Anderson, The Pilgrim Migration: Immigrants To Plymouth Colony, 1620-1633 (Boston: New England Historic Genealogical Society, 2004), p. 102. Hereinafter cited as The Pilgrim Migration. She was born after 1622 at Leyden, Holland.1,3 She was the daughter of Roger Chandler and Isabella Chilton.2 She married Edmund Bruff [Brough] before 1653 at Plymouth Colony.3 She died on 15 August 1658 at Boston, MA. [S129] Robert Moody Sherman & Verle Delano Vincent- Rev by Robert S. Wakefield, Mayflower Families Through Five Generations, Vol 15 (4 Winslow St., Plymouth MA 02360: The General Society of Mayflower Descendents, Plymouth, MA:1997, 1997), p. 5.. Hereinafter cited as Mayflower Families Thru 5 Generations. [S287] Marriage Certificate of Roger Chandler and Isabel Chilton, City of Leiden, The Netherlands, May 1615; . Hereinafter cited as Chandler-Chilton Marriage Cert; DOC 364. [S646] Robert Charles Anderson, The Pilgrim Migration: Immigrants To Plymouth Colony, 1620-1633 (Boston: New England Historic Genealogical Society, 2004), p. 101. Hereinafter cited as The Pilgrim Migration. [S646] Robert Charles Anderson, The Pilgrim Migration: Immigrants To Plymouth Colony, 1620-1633 (Boston: New England Historic Genealogical Society, 2004), p. 521. Hereinafter cited as The Pilgrim Migration. [S646] Robert Charles Anderson, The Pilgrim Migration: Immigrants To Plymouth Colony, 1620-1633 (Boston: New England Historic Genealogical Society, 2004), p. 103. Hereinafter cited as The Pilgrim Migration. [S646] Robert Charles Anderson, The Pilgrim Migration: Immigrants To Plymouth Colony, 1620-1633 (Boston: New England Historic Genealogical Society, 2004), p. 102, 99. Hereinafter cited as The Pilgrim Migration. [S129] Robert Moody Sherman & Verle Delano Vincent- Rev by Robert S. Wakefield, Mayflower Families Through Five Generations, Vol 15 (4 Winslow St., Plymouth MA 02360: The General Society of Mayflower Descendents, Plymouth, MA:1997, 1997), p. 8. Hereinafter cited as Mayflower Families Thru 5 Generations. [S129] Robert Moody Sherman & Verle Delano Vincent- Rev by Robert S. Wakefield, Mayflower Families Through Five Generations, Vol 15 (4 Winslow St., Plymouth MA 02360: The General Society of Mayflower Descendents, Plymouth, MA:1997, 1997), p.8. Hereinafter cited as Mayflower Families Thru 5 Generations. [S140] Ruby Parke Anderson, The Parke Scrapbook (Baltimore, MD: Port City Press, Inc., 1965), p. 1. Hereinafter cited as The Parke Scrapbook. [S156] Unknown author, "unknown article title," The American Genealogist: XXXIII(1957), 11-13. [S160] Henry James Young, The Blackmans of Knight's Creek (Carlisle Pennsylvannia: Privately printed, 1980), page 55.. Hereinafter cited as Blackmans of Knights Creek. He died at Semer, Suffolk, England, U.K..
[S160] Henry James Young, The Blackmans of Knight's Creek (Carlisle Pennsylvannia: Privately printed, 1980), page 58.. Hereinafter cited as Blackmans of Knights Creek. He married Jean MacLeod, daughter of John Green MacLeod and Bertha Alice Holt, on 5 June 1949 at Tisdale, Saskatchewan. Marriage* He married Jean MacLeod, daughter of John Green MacLeod and Bertha Alice Holt, on 5 June 1949 at Tisdale, Saskatchewan. She was the daughter of Theodore Chapman and Julia Eliza Wadsworth. She married Prof. (?) Edgren. She died in January 1909 at California. Marriage* She married Prof. (?) Edgren. She is the daughter of Theodore Chapman and Julia Eliza Wadsworth. She is the daughter of Harry Chapman. She married Milton Harmon Johnson, son of Milton Johnson and Esther Wright. She married Milton Johnson, son of Jesse Johnson and Sarah Wadsworth, on 3 December 1829. Marriage* She married Milton Johnson, son of Jesse Johnson and Sarah Wadsworth, on 3 December 1829.